When your opener breaks, you'll want to have the unit replaced quickly so that you wouldn't be inconvenienced very long. While it can be tempting to try and repair it or install a new one by yourself, it can be quite dangerous without the proper training. When you call our Garage Door Repair Encinitas team, you can rest assured that professional technicians with years of experience are taking care of your problem. There are a number of advantages screw drive openers have to offer, mainly that they are easy to maintain because they have only a few moving pieces. They are often quieter than the chain drive type, as well as smoother in their operation. However, they can be a little more expensive than the other types. Even quieter than their screw drive counterparts, belt drive openers are renowned for their speed and relatively silent operation. They are a little more expensive than the chain drive, but are certainly worth it for any homeowner that values smooth and quiet operation. These are the most common types of openers out there, and for good reason. They are incredibly sturdy and less expensive than the other options. However, they tend to require regular adjustment or more frequent professional maintenance in order to maintain the quality of their operation. They also tend to be a little noisy. 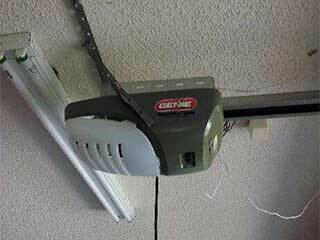 When you want to make sure that you get the best opener for your garage door, be sure to call our experts at Garage Door Repair Encinitas. Not only do our professionals have the knowledge necessary to help you choose the best unit for your specific needs, we can easily install it for you as well.